The intent of this toolkit is to provide an educational resource conveying the benefits of sustainability and how these principles apply to site design. 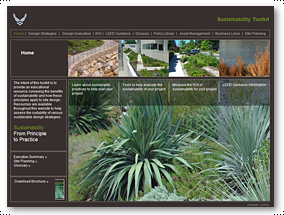 Resources are available throughout this website to help assess the suitability of various sustainable design strategies. There is an interactive Evaluation tool to help planners/designers visualize sustainable practices in action. Current enhancements to this project include interactive ROI calculators.